Here you go. First Install given kexts with any kexts utility. Make a folder in the root of your Hard Disk and name it "kernel" or anything you prefer. Copy new kernel to new created folder, I used kernel as folder name and mach_kernel as kernel name. First of all, welcome to the new and updated install guide for the Intel Haswell NUC ! This new guide is written specifically for the latest bios versions (0025) & (0026) and most recent version of OS X (10.9.4). The NUC is the slightly newer version that has a larger chassis and can accommodate a 2.5" SSD in addition to the mSata. The ram is a newer product from G.Skill. It runs at the same 1.35v, but is very fast, and has a lower latency of CL9. It is the ram I recommend for anyone considering an NUC. This time around, the guide is much simpler than before. We will use the same tools, but there is no need to mess about using Chameleon for bits of the process. Gone are the days of having to patch and compile a DSDT file every time the bios is updated. In fact, the DSDT file has been completely removed. The tweaks that were provided by the DSDT file are still present but have been moved, and should survive any future updates. The audio section has been simplified to make it much easier to install & enable HDMI audio, as well as providing a new AppleHDA.kext file. For those who used the original guide to install OS X 10.9.1, you will be pleased to know that performance and stability is back to those levels too ! As before, the guide is only verified to work with the versions stated; that is version 0025 & 0026 for the bios and 10.9.4 OS X. Since 10.9.4 is stable and 100% working on the NUC, there is no need to use older versions of the software. Several changes have enabled this since last time, including the newer builds of OSX, Multibeast and Chimera. As previously, I recommend you do your homework; read this guide from start to finish before commencing the install. We will be using the standard TonyMacX86 tools to achieve this (Chimera/Multibeast/Unibeast). Finally before we start, thanks and a hi-five go to resident mod Toleda and user minihack for their help. Without it this guide would not have been possible. Right then, lets gets started ! Take your time and pay attention to the guide; follow it to the letter. Copy the files to the exact locations specified. Run the programs from the locations specified. This is important to help ensure a successful build. Note : The motherboard in each of the 3 packages contains the same hardware. Note : The built-in microphone probably won't work; this is at the expense of having a more robust audio output without dropouts and fuzziness. Note : Other wireless LAN/bluetooth cards may work but have not been tested at this time. Note : CIR (Consumer Infra-Red) on the NUC is NOT working at this time. Summary : The working state of the hardware looks good with the minor exception of the CIR device, which is not likely to ever have support. Note : Some site registrations may be required. Note : Other software versions *may* work but are not supported by this guide. Summary : Download the specified versions of the software we use, using the links provided. The bios version should be 0025 or 0026. For version 0025 the bios version string should read WYLPT10H.86A.0025.2014.0303.1008. For version 0026 the bios version string should read WYLPT10H.86A.0026.2014.0514.1714. a. Security > Intel(R) VT for Directed I/O (VT-d). b. Boot > Boot Priority. 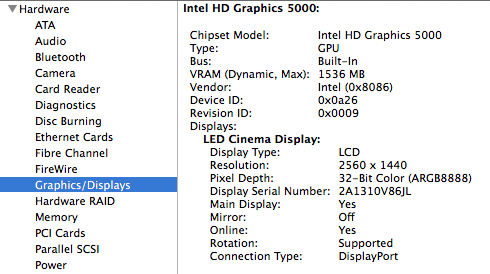 Note : The NUC Install Pack includes screenshots of all the bios settings you should use. Summary : Make sure you setup the bios correctly before you begin, otherwise it might not work. To create the Unibeast Installer we will use the official Unibeast guide and then customize it to work with the NUC. You will need a blank USB memory key for this. An external USB2 or USB3 hard drive works just as well but the drive will be completely formatted as part of the process, so if you decide to use an external hard drive, make sure it does not contain any important data. The advantage of using an external hard drive is that the install completes much quicker. Regardless of whether you choose a USB memory key or external hard drive, it should be at least 8Gb capacity. First, head over to the official Unibeast creation guide which can be found here, and follow Steps 1 and 2 of that guide. Be sure to label the chosen memory key / hard drive as 'USB', as directed in that guide. Once those 2 steps are complete, you have a standard Unibeast Installer. Before we can use it, we need to customize it to make it work with our NUC. You will be prompted for your password; go ahead and type in your password then press Enter. This has made some files and folders visible on the Unibeast installer, which were hidden when it was created. You can now exit the 'Terminal' app. We need to copy those 3 files to the Unibeast Installer. In Finder, copy the file mach_kernel FROM the NUC Install Pack TO the root of the Unibeast Installer, overwriting the existing one. Copy the files smbios.plist and org.chameleon.boot.plist FROM the NUC Install Pack TO the /Extra folder of the Unibeast Installer, overwriting the existing ones. 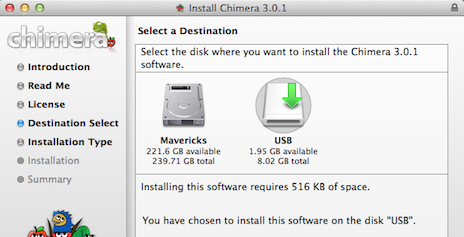 Close Chimera 3.0.1 once it has finished installing. On the Unibeast Installer drive, go to the '/Extra/modules' folder. Delete the file called 'HDAEnabler.dylib'. At the root of your Unibeast Installer drive, create a folder called 'Software', and copy all the software you downloaded into this folder, including the NUC Install Pack. However, do NOT copy the OSX Installer app, just the other software. This will save you having to swap drives around later. Summary : We have created a standard Unibeast Installer, with customized kernel and configuration files, updated bootloader and the necessary software we will need during installation. We are now ready to commence the installation of OS X to the NUC. Insert your Unibeast Installer drive to a free USB port on the NUC and reboot it. When it boots, press F10 to get to the boot menu and select the Unibeast Installer drive to boot from. After a minute or so of loading files, you will see the usual OS X installer screen. First thing to do is load the Disk Utility and partition your drive accordingly. I used the entire capacity of the drive and labelled it 'Mavericks'. The rest of the guide assumes you have used the same label; you are free to rename it after the installation is complete. When you are done partitioning, start the installation and let the OSX Installer do its magic. At the end of the install when prompted you should reboot your NUC, but leave the Unibeast Installer connected. Once again, when the NUC boots, press F10 to get to the boot menu and select the Unibeast Installer drive to boot from. 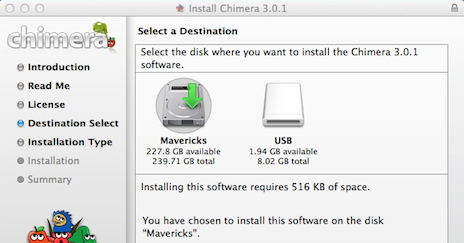 This time you will see the Chimera boot screen with a 'USB' icon and also a 'Mavericks' icon. Now exit the 'Terminal' app. Summary : We now have OS X fully installed to the NUC system drive (Mavericks) and the modified kernel in place that will allow it to boot correctly. The time has now come to setup Multibeast & Chimera on your NUC. Quit the OS X Installer and reboot your NUC but leave the Unibeast Installer plugged in. Press F10 to get the boot selection screen and select the Unibeast Installer drive to boot from. After a minute or so of scrolling files up the screen, the NUC should now boot into the OS X installation. You will be presented with the usual configuration steps where you complete the keyboard & network selection, license agreement and create a new User Account. Complete these steps as normal and you will reach the OS X desktop screen. Before we go any further, copy all of the software FROM the 'Software' folder you created on the Unibeast Installer drive TO the Downloads folder of your NUC. Unzip the NUC Install Pack in the Downloads folder. Now, from the Downloads folder of your NUC, unzip and start Multibeast and load the NUC.mb configuration file from the NUC Install Pack. This will pre-select all the files and options we are interested in. You will see some warnings generated during the Multibeast installation about kernel extensions being from unidentified developers; this is fine and you should dismiss these warnings by clicking 'Ok' when prompted. Not many options are pre-selected in Multibeast and for good reason; Chimera is not selected as we will install a newer version, also no System Definition is selected since the one we want is not available in Multibeast yet. The correct System Definition (MacbookAir6,2) has been created for you and is contained within the smbios.plist file in the NUC Install Pack. Close Chimera once it has finished installing. On the NUC system drive (Mavericks), go to the '/Extra/modules' folder. Delete the file called 'HDAEnabler.dylib'. Finally, unzip the file called 'audio_ssdt-hdmi-nuc_hd5k-1_v2.zip' in your Downloads folder. 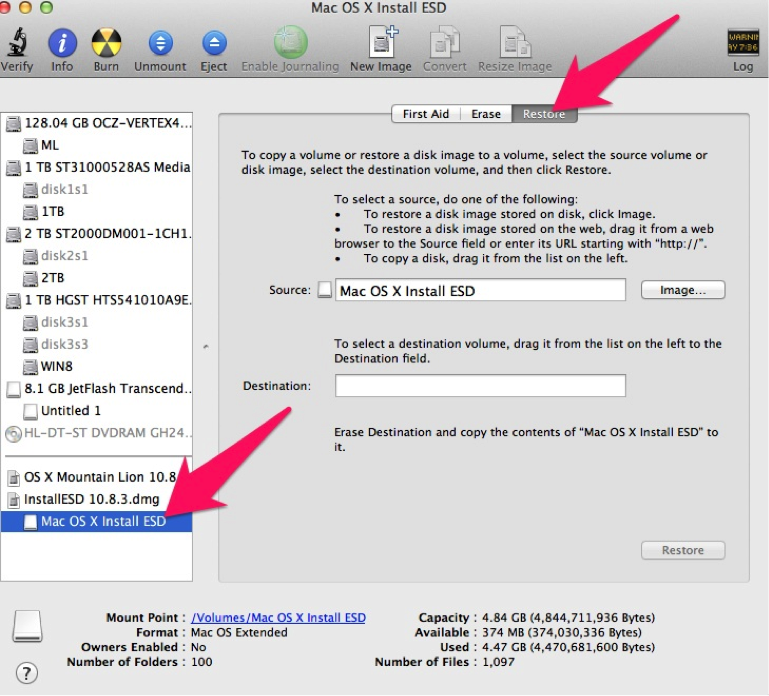 In the resulting folder you will find a file called 'SSDT-1.aml'; you should copy this to the /Extra folder of your NUC system drive (Mavericks). You can now eject the Unibeast Installer and reboot the NUC. Your NUC should now boot on its own. Summary : We now have a basic configuration installed and made the NUC bootable. Before you run through this section, you should backup a couple of important files and keep the originals in a safe place. Store them somewhere safe so that if the audio patches change in the future, you can restore these and run the patches on original versions of the file. Unzip and install the DPCIManager program found in your Downloads folder, and then run it. In DPCIManager, click on the icon at the top centre to 'Install Kext'. Using the file selector, point it to the file in the NUC Install Pack called 'AppleHDA.kext', and allow it to install the file. When prompted, allow it overwrite the existing one. Once you see the above code in the Log window, you can close the DPCIManager program. Double click each file to unzip it, and then double click each of the unpacked files to apply the actual patch. You can apply them in any order, but you will be prompted for your password when applying the first one. Finally, run DPCIManager again, but this time select the option to 'Rebuild Cache' and enter your password when prompted. As above, wait until you see those lines appear at the top of the Log window; this may take a minute or so to complete. Thats it. Full HDMI audio is now enabled and setup ! Yours may look a little different depending which display you have connected. 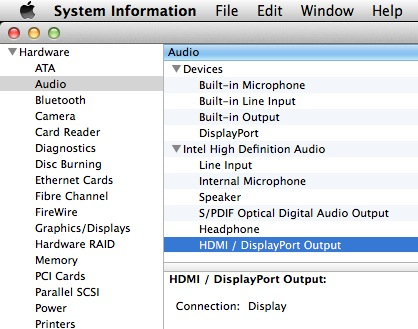 HDMI displays do not offer volume control in Sound Preferences or the volume slider at the top of the screen; the idea is that you use the remote control or on-screen settings to adjust the volume for that type of display. This is by design and how it is meant to work. The new AppleHDA supplied in the Install Pack will automatically switch the output device to 'Internal Speakers' when you plug headphones or speakers into the 3.5mm audio connector on the front of the NUC, and will revert back when you unplug them. Nice ! 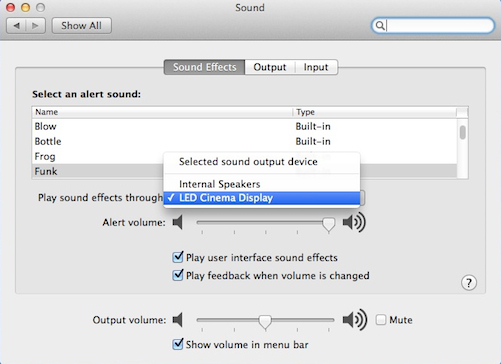 Summary : OS X is now configured with full audio capability. This section is not strictly necessary as your NUC is now fully configured, but I have included this to help make it look and feel more like a real mac. From the NUC Install Pack, right-click and copy the file called 'com.apple.macbookair-13-unibody.icns'. Navigate to 'System/Library/CoreServices'. Right click on the file 'CoreTypes.bundle' and click on 'Show Package Contents'. Then click on 'Contents' and then 'Resources'. Here you will see lots of colorful icons and folders. In this resources folder, right-click and then 'Paste' the file. It will ask if you wish to overwrite the existing file; go ahead and allow it to overwrite. In here you will see several text lines, the one we are interested in is at or around line number 8, and is enclosed in <string> and </string> tags. It contains the Macbook Air model & Year. You can change the exact model name in brackets above, based on which model of NUC you have. Go ahead and save the file. You can copy & paste from the replacement lines above, and change the Serial Number and ram manufacturer to match yours. In the examples I give, pay particular attention to the 2 spaces immediately after the '%1$@'. Those 2 spaces must remain, irrespective of what values you use. If you don't leave the spaces, it will not work correctly. Once you have finished your changes, save the file and close TextWrangler. You may be prompted for your password when you do the save. 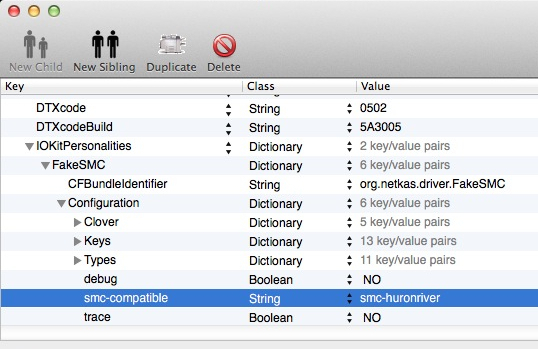 Here we will make a small change to the FakeSMC.kext to make it report the correct SMC version for our System Definition (MacbookAir6,2) and also SMC type. Using OS X Finder, copy the file FakeSMC.kext from '/System/Library/Extensions' to your OS X Desktop. Right click on this file and select 'Show Package Contents'. Open the 'Contents' folder, and copy the file Info.plist to your desktop. In your Downloads folder, unzip and install the 'PlistEditPro' program. 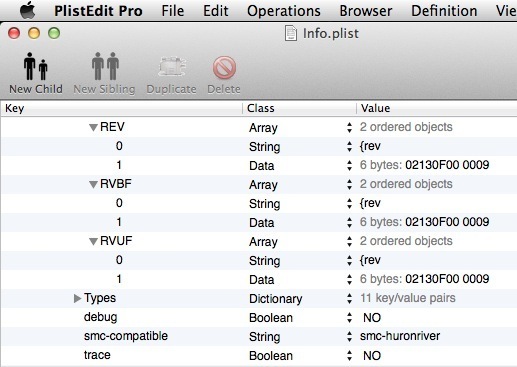 Open PlistEdit Pro and open the Info.plist file on your desktop. Item 1 under the 'REV' subkey is where we make the next change. It currently holds the default SMC version of 1.30f3. We want to change this to the correct version for the MacbookAir6,2, which is version 2.13f9. Now drop down one key level from 'REV' to 'RVBF' and repeat the process. Finally drop down one level again from 'RVBF' to 'RVUF' and repeat the process again. What we have done is set the correct SMC type, and changed 3 instances of the SMC version to the correct version number. Save the file and close PlistEdit Pro. Right click on the Info.plist file on the desktop and select 'Copy Info.plist'. Now, right click on FakeSMC.kext on the desktop and once again select 'Show Package Contents'. Navigate into the 'Contents' folder and then paste the updated Info.plist by right clicking and selecting 'Paste Item'. Replace the existing one when prompted. What we have now done is to extract the Info.plist file from FakeSMC.kext, made some changes and put the updated file back. All we need to do now is install the updated FakeSMC.kext on our system and reboot. Open the DPCIManager program, click on the 'Install Kext' icon at the top center of the screen, and select the FakeSMC.kext file on the desktop. You will be asked if you want to overwrite the existing one, to which you should click on 'Ok', and after entering your password, the newly updated FakeSMC.kext will be installed. Something to consider is that FakeSMC can be updated by using the update option of HWmonitor. Each time you update, the correctly edited FakeSMC will be overwritten, so you will need to go back and repeat this edit whenever you update FakeSMC. Summary : The NUC now has a few extra tweaks to make it look more mac-like. You have now reached the end of the guide. As with the previous guide, if you have any issues with something not working as expected, please make a post detailing what you think is wrong and why. Screenshots help with this too. I will not respond to requests for help without this information provided. HWmonitor generates a warning in the system log about being unable to parse the maximum RPM for Fan1 and Fan2. This is an issue with HWmonitor itself and not with your NUC. Version 10.9.4 of OSX works just fine on the NUC. Post #315 of this thread contains a short guide to updating from 10.9.3 to 10.9.4. 27/05/2014 - Added reminder to copy and run files from correct locations. First mount clean untouched InstallESD.dmg from your appstore mountain lion installer version 10.8.3 like this. Choose your USB stick,and then click partition. 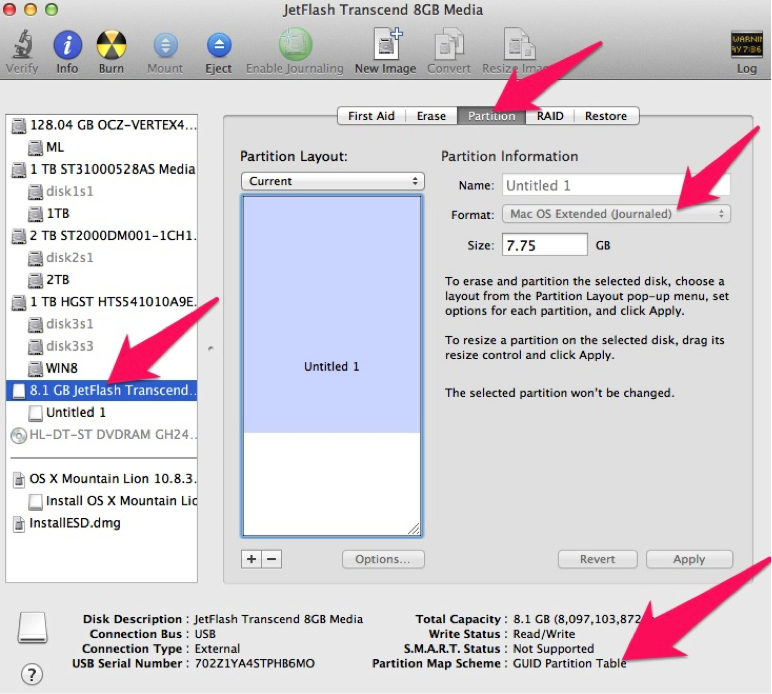 Then Click option and choose GUID partition table ,click ok. Choose Format to Mac OS Extended (Journaled),and hit apply,then partition. Now your USB should look like this. Next we will restore InstallESD.dmg to our newly formatted USB stick. then drag your Untitled 1 to destination. Next click restore,and then erase and wait till finish. 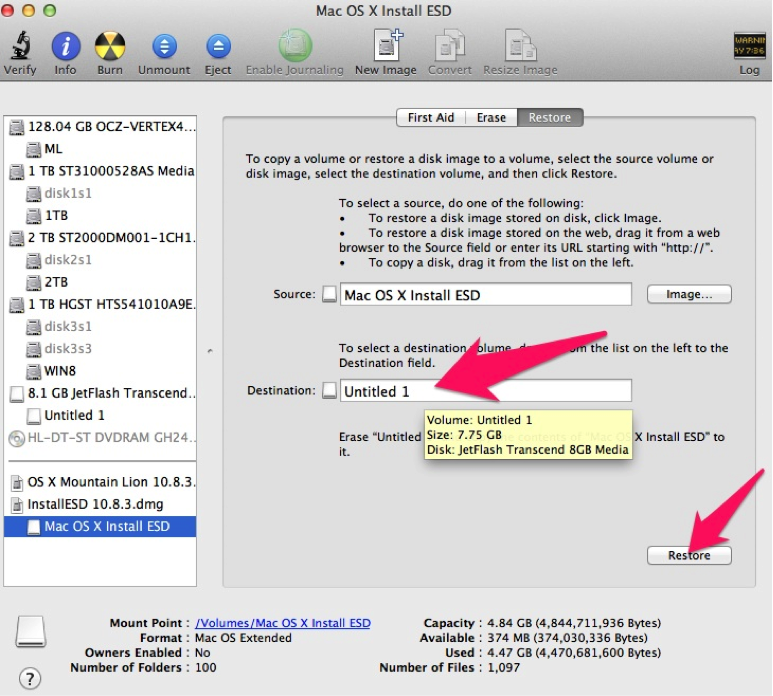 Unmount all of your MAC OS X install ESD then replug your USB stick. 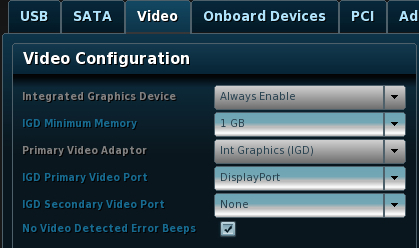 Now start latest clover setup and choose options for bios booting. No drivers needed for this. First stage of setup should start and we install OSX, setup will restart. After restart we again boot from USB and choose Install OSX option,press space and choose NoCaches With Kext option. Setup will now finish stage 2 and again restart. Again boot from USB and select name of your new installed OSX and press space choose with kext.